If you’re creating a playroom for your child there’s one key piece of kids furniture that you must get… it’s a kids table and chair set. Imagine the fun your child will have when doing puzzles, crafts, playing games, using play dough and having tea parties with friends at his/her very own kid size table. If space is limited then consider getting a kids table and chair set that comes with built-in storage for keeping papers and craft items readily available. 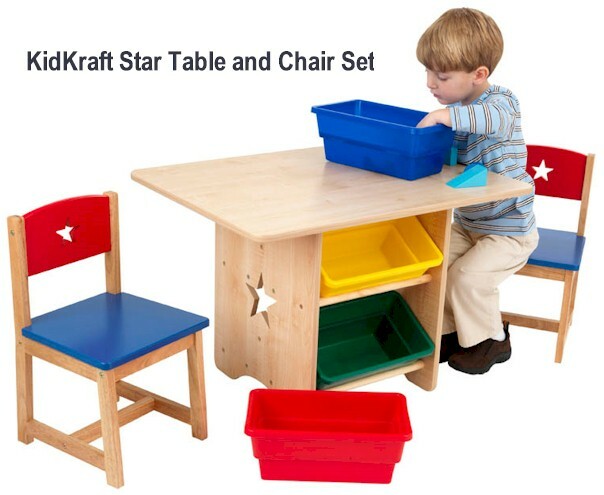 The KidKraft Kids Star Table and Chair Set is perfect for any boy or girl with its primary color scheme and 2 huge center storage bins. This set comes with two chairs, so siblings can play together or your child can invite a friend to join him/her for a snack or a game. Use the bins to keep specific items in order or assign one bin to each sibling, so they can keep their craft supplies separate. If the primary colors of the KidKraft Set don’t match your playroom theme, there are plenty of other sets to choose from at SimplyKidsFurniture.com. To get your child the perfect Kids Table and Chair Set visit us today. There’s no other piece of kids furniture that your child will enjoy more!